From left: Office of Medical Student Education Associate Director of Mentorship and Outreach Jacqueline Gerhart, MD; first-year medical student Brooke Olson; Olson’s mentor Bethany Howlett, MD; fourth-year medical student Megan Bartz. Building on nationally recognized success introducing UW School of Medicine and Public Health (SMPH) students to family medicine, the UW Department of Family Medicine and Community Health’s (DFMCH) Office of Medical Student Education (OMSE) has made even more improvements to its mentoring and advising program. Those improvements, which began in September 2017, have already resulted in an approximately four-fold increase in the number of SMPH students showing interest in a possible career in family medicine. 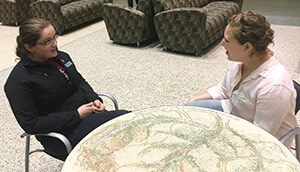 The mentorship part of the program helps first- and second-year students learn more about family medicine through individual connections with volunteer faculty. Students first review the Mentor Bios page on the DFMCH website to learn about faculty interests before requesting a mentor online. Mentor-mentee relationships are individualized based on shared interests and student need. Some pairs engage via email, while others collaborate in person on clinical care, research or public and community health projects. First-year medical student Brooke Olson met her mentor, Bethany Howlett, MD, in person for the first time while learning how to deliver a baby with shoulder dystocia at December’s Basic Life Support in Obstetrics (BLSO) Certification course. Olson, who is in the SMPH’s Wisconsin Academy for Rural Medicine (WARM) program and who has an interest in public health, is excited to get to know Dr. Howlett better and to shadow her in clinic. 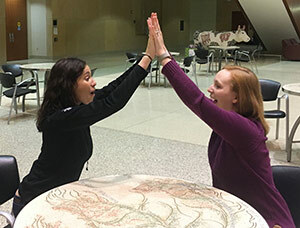 “She is offering me so many opportunities already, and I cannot wait to see how our student-mentor relationship grows over the years,” she says. Third- and fourth-year students who have decided to pursue a residency in family medicine benefit from the advising part of the program. Program faculty and staff reach out to those students months before residency applications open. They offer assistance with the overall process: the match list, the ERAS application, personal statements and interviewing tips. The SMPH Student Services Office also informs students interested in family medicine about the resource. The program supplements existing Family Medicine Interest Group (FMIG) activities, such as the annual procedures fair, the Basic Life Support in Obstetrics (BLSO) Certification course, workshops and social events. DFMCH OMSE Programs Coordinator Joyce Jeardeau, ACUME, promotes the program at every FMIG event, handing out informational cards and answering questions from interested students. She says that the outreach has been successful: as of December 15, 2017, five students have contacted her for mentorship, and 19 students have contacted her for advising.